Mortgage lenders may have violated federal anti-kickback laws by bending the rules of a co-marketing program that lets them pick up part of the tab when real estate agents advertise their services on Zillow. That’s according to a lawsuit filed by a Zillow inside sales consultant, who also claims the listing portal’s employees helped lenders create fake agent profiles on the site so they could receive inquiries that consumers thought they were submitting to licensed agents. Ashley Boehler, an inside sales consultant hired by Zillow in September 2012, claims officials with the listing portal turned a blind eye to such practices, and then retaliated against him for notifying upper management about what he called a “pay for play” arrangement between lenders and real estate agents participating in Zillow’s co-marketing program. The co-marketing program, launched in June 2013, allows “Premier Agents” who pay for advertising on Zillow to invite lenders to share marketing costs by paying Zillow to appear as “Preferred Lenders” in advertising alongside the agent on the portal. Agents specify the dollar amount they would like each lender to contribute. A single lender is allowed to pay for up to half of an agent’s total monthly ad spend, according to an FAQ on Zillow’s website. If an agent has multiple preferred lenders, they may cumulatively pay up to 90 percent of the agent’s monthly advertising costs. But Boehler’s lawsuit alleges that some individual lenders were paying up to 90 percent of an agent’s ad spend on Zillow. For a single lender to pick up that much of the agent’s tab would violate anti-kickback provisions of the Real Estate Settlement Procedures Act (RESPA), according to Benjamin Meiselas of Geragos & Geragos, one of the law firms representing Boehler. Other experts told Inman it’s not clear whether RESPA — which bars mortgage lenders, title insurers and other settlement services providers from paying referral fees to real estate agents and others in exchange for referring business to them — would apply. Part of Boehler’s job was to make cold calls to agents he would find on other listing sites and try to sell them ads on Zillow, Meiselas said. During those calls, Boehler was instructed to talk up the co-marketing program and tell agents that 90 percent of their costs can be defrayed by lenders. “Agents are very wary of the expenses and the costs of advertising on Zillow,” Meiselas said. Boehler says he was able to see the credit card payments made by agents and lenders participating in the program on an internal terminal. By matching up credit card numbers, he could see that in many cases lenders were paying up to 90 percent of an agent’s ad spend, sometimes by creating different lender accounts for representatives of the same mortgage bank, Meiselas said. “The lenders are funding advertisements for brokers at vastly disproportionate rates,” he said. “The average consumer who’s going (to) Zillow doesn’t realize” that. Boehler also alleges that Zillow employees were responsible for creating Premier Agent contracts between Zillow and agents who did not exist. The fake Premier Agent profiles contained contact information that routed consumers to a lender rather than a licensed real estate agent. “Zillow’s looking the other way. There are so many easy fixes to prevent that from happening,” he said. Boehler’s lawyers allege he was subject to retaliation for raising concerns with Zillow’s management regarding “numerous instances of systematic and pervasive fraudulent activity that permeated throughout Zillow’s Irvine office,” as well as general working conditions and pay issues. Zillow spokeswoman Katie Curnutte said the company does not comment on specifics of pending litigation. “However, I can tell you Zillow takes any allegations about our work environment very seriously. We take pride in our strong culture and reputation as a best place to work. Our people are our most important asset and we are committed to providing a safe and productive work environment for everyone,” she said. 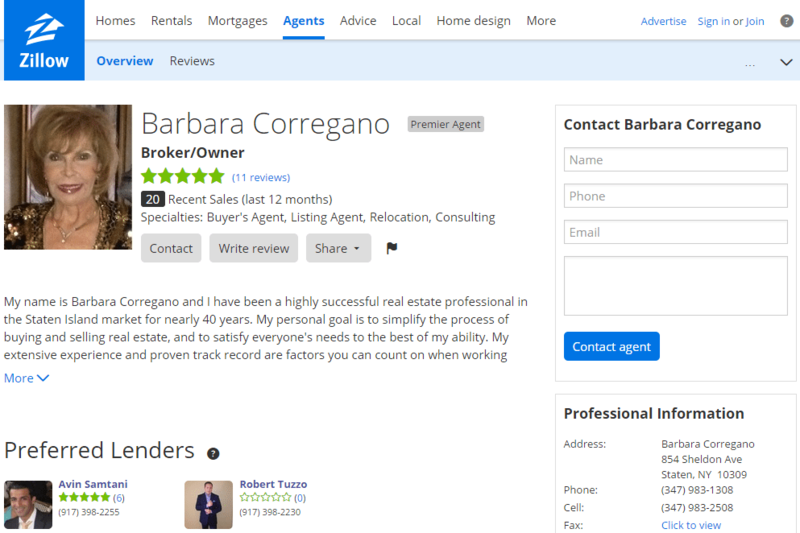 Inman found at least one instance of two representatives of one lender displayed on a Premier Agent’s profile as “Preferred Lenders” — that of Staten Island, New York-based broker-owner Barbara Corregano. The representatives are identified by name on the profile, but not by their company name, Vanguard Funding LLC. A consumer would learn that both were affiliated with the same lender by clicking on their profiles. When a consumer clicks on the question mark next to “Preferred Lenders,” an info box pops up that indicates the agents knows and recommends the lender. It is unclear from the profile how much of Corregano’s ad spend is covered by the lenders, though documents obtained by Inman indicate she pays only 10 percent of the $1,641 monthly cost of her subscription, and the rest is covered by the lender representatives. According to the U.S . Department of Housing and Urban Development (HUD), RESPA does not prohibit real estate agents and mortgage bankers from advertising jointly. “However, if one party is paying less than a pro rata share for the brochure or advertisement, there could be a RESPA violation,” the federal agency said in an FAQ. Jay Varon, a Washington, D.C.-based litigation lawyer specializing in RESPA at Foley & Lardner LLP, said, in general, loan originators paying 90 percent of a real estate agent’s advertising could raise RESPA issues, but are not necessarily violations of RESPA. “You would have to know among other thing what type of visibility in the ad the lender received; whether there were other marketing expenses or services that the real estate agent had fronted so that these payments needed to be looked at in a broader picture; whether the agent was in fact referring business to the LO or whether there was an agreement to refer business to the LO that was RESPA-covered, etc.” he said. He said a loan originator setting up an account with Zillow by posing as a real estate agent was likely not a RESPA violation. “Section 8 of RESPA requires the payment for referrals and getting a lead from a consumer clicking on an ad is not typically a referral. But such conduct could be potentially actionable under a variety of misrepresentation (or) breach of contract-type claims depending on what Zillow’s rules were and what the LO actually represented and did,” Varon said. The premise that the relationship between Zillow co-marketing agents and lenders is not referral-based is false, according to Jillayne Schlicke, founder and executive director of the National Association of Mortgage Fiduciaries. The moral of the story, Schlicke wrote, is for agents and loan originators to do their own due diligence on the legalities of the program rather than relying on the word of an advertising salesperson. “Zillow pretty much says in their Terms of Service that it is ultimately the responsibility of each lender and agent to ensure their own compliance with the laws and regulations to which they are subject. Which means the program may or may not be compliant and it’s up to real estate agents and LOs to figure out if they are or are not violating RESPA,” she said. According to the complaint filed by Boehler’s lawyers, his supervisors took no action after being alerted to the alleged fraud, prompting Boehler to send an anonymous email to Zillow’s executive team at the Irvine office and to upper management at the company’s corporate office in Seattle in November 2013. He later revealed his identity only to upper management in Seattle. “This matter needs immediate attention. Our entire company, our Premier Agent product, and the lender co-marketing program could be at risk. Local management has been informed of these accounts over one month ago and refuses to take action,” the email said. Shortly thereafter, Boehler allegedly received an email from Chad Cohen, Zillow’s chief financial officer, assuring Boehler his name would be kept confidential, thanking him for pulling the information together, and saying such activities “must never be tolerated,” according to the complaint. Zillow allegedly later fired “certain Zillow employees” as a result of Boehler’s actions. Boehler’s lawyers allege that, despite assurances his identity would remain confidential, he began to suffer retaliation from Zillow management in the Irvine office for “blowing the whistle,” including negative reviews for his work, withheld leads, sales accounts taken from him and given to other colleagues, and micromanagement of his daily tasks. Boehler’s access to lender payments was also terminated, Meiselas said. Boehler is still a Zillow employee, “although they make his life extremely difficult on a day-to-day basis,” Meiselas said. Zillow prohibits referrals between Zillow Premier Agents and their Zillow Preferred Lenders, though referrals by agents and lenders that are completely separate from the Zillow co-marketing program are allowed. Boehler was unable to see whether referrals took place, but Meiselas maintains Zillow nonetheless facilitated violations of RESPA. “Whether or not (a referral) actually occurs, while that’s significant, it’s not what RESPA is all about because RESPA is a proactive remedy,” Meiselas said. Meiselas emphasized that Boehler did not have access to all 60,000 or so Premier Agent accounts and therefore his lawyers will be looking into how widespread the alleged violations were and are. “This may just be the tip of the iceberg,” Meiselas said. The federal agency that regulates RESPA compliance, the Consumer Financial Protection Bureau, did not respond to a request for comment for this story. Neither Boehler nor his lawyers have filed a complaint with the CFPB, but they haven’t ruled it out, Meiselas said. They also have not ruled out litigation specifically on the RESPA allegations rather than on the retaliation against Boehler, Meiselas added. “All options are on the table. We just want to make sure a full investigation is undertaken. We anticipate there will be robust discovery” on the RESPA issues “because they were a focal point of the retaliation that Ashley received,” Meiselas said. The lawsuit accuses Zillow of retaliation, intentional infliction of emotional distress, negligent infliction of emotional distress, and violation of the Sarbanes-Oxley Act, which provides protections for corporate whistleblowers. The complaint demands a jury trial, though the court has directed that the parties first go through an alternative dispute resolution process to see if they can come to a settlement. The law firms representing Boehler — Geragos & Geragos and Samini Scheinberg, PC — are also representing the plaintiff in another employment suit against Zillow filed on Nov. 19. That complaint alleges that no fewer than 120 employees who worked for Zillow in California in the last four years were required to miss meal and rest breaks and work overtime without compensation. The suit seeks class-action status and claims employees’ undocumented and uncompensated hours add up to more than $5 million. That case must also go through an alternative dispute resolution process before trial. These are not the only lawsuits Zillow has to contend with. Last month, Top Agent Network, a company that helps agents share information about pocket listings, sued Zillow for alleged misappropriation of trade secrets, claiming the search portal represented itself as a potential investor in order to copy one of the network’s products and launch a “Coming Soon” feature. Zillow has yet to file a response to the suit. In July, a state Superior Court judge granted a preliminary injunction against Zillow and its chief industry development officer, Errol Samuelson, in another trade secrets suit brought by Move Inc. and the National Association of Realtors.